Part One. Multiple Criteria in Agricultural Decisions. 1. Main features of the MCDM paradigm. 2. Some basic concepts. Part Two. Multiple Criteria Decision Making Techniques. 3. Goal programming. 4. Multiobjective programming. 5. Compromise programming. 6. Structure of an interactive MCDM process. 7. Risk and uncertainty and the MCDM techniques. Part Three. Case Studies. 8. A compromise programming model for the agrarian reform programme in Andalusia, Spain. 9. Livestock ration formulation and MCDM techniques. 10. Livestock ration formulation with penalty functions via goal programming. 11. Optimum fertilizer use via goal programming with penalty functions. References. Subject Index. 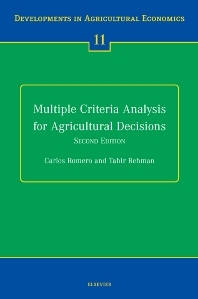 This book presents the Multiple Criteria Decision Making (MCDM) paradigm for modelling agricultural decision-making in three parts. The first part, comprising two chapters, is philosophical in nature and deals with the concepts that define the underlying structure of the MCDM paradigm. The second part is the largest part consisting of five chapters, each of which presents the logic of a specific MCDM technique, and demonstrates how it can be used to model a particular decision problem. In the final part, some selected applications of the MCDM techniques to agricultural problems are presented and thus reinforce the development of an understanding of the MCDM paradigm. The book has been designed for use at different levels: as a textbook for final year undergraduate and postgraduate courses in modelling for decision-making; as a manual for researchers and practising modellers; and, as general reference on the application of MCDM techniques. Readers with basic appreciation of algebra and linear programming can easily follow the contents of this book.